We spent a week at the end of June on the Amazon River in Peru with International Expeditions. Fantastic trip, more on that in a later post. 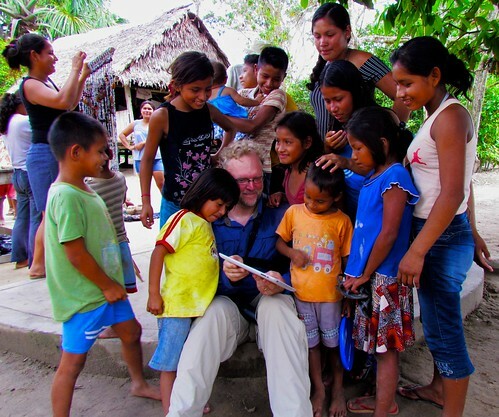 One afternoon, we visited a village — Nueva York — along the Amazon. 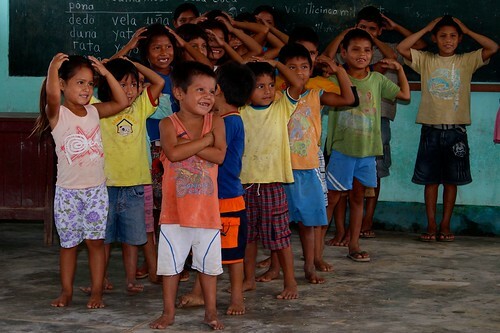 We spent some time with the children of the village, learning a bit of spanish and teaching them a bit of english (Head! Shoulders! Knees and Toes! Knees And Toes!). One of our guides asked me to show the kids my iPad as they had never seen anything like it before. It took a moment, but they were enthralled. The big hits were Photo Booth and a simple finger painting app. It was quite gratifying to see the kids take to the iPad and start using the apps so naturally. 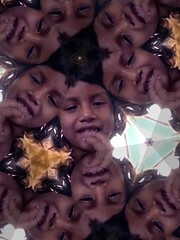 They quite quickly learned how to change and control the effects in Photo Booth. Including taking their own pictures, as seen at the right. Of this wonderful experience — the kids were fantastically good natured and the adults were warm / welcoming — there were two standout events that I shall relay, one purely cultural and the other just flat out cute. When I first launched Photo Booth and showed it to one child, I was a bit surprised by the reaction. It was sort of, “Well, that’s neat.. but.. meh, weird pictures of a person isn’t that interesting”. When I turned the iPad so his friend could see, the second kid’s reaction was the same, but the first child completely lit up with laughter as soon as the second kid’s face was on screen! Then the same happened when I rotated back to the first child. As it turns out, there are pretty much no mirrors anywhere outside of, maybe, a hand mirror or two. Children really don’t see themselves on a regular basis save for on the back of a digital camera in the hands of a tourist (we were encouraged to always show them any pictures we took). Thus, seeing “self” just wasn’t very interesting at all. Once I suspected this was the case, I saw this same behavior with pretty much every child who saw Photo Booth for the first time! The really cute event happened when I was showing a little girl — maybe 6 or 7 years old — the finger painting application. It took her a second, but she got into it and had quite a bit of fun making a smily face. I showed her that the color could change and then left the color picker (a little grid of color swaths) on the screen for her to pick. Then carefully tapped light blue. Then looked at the tip of her finger to make sure the color was picked up. Disappointed that her finger wasn’t blue, she tried again with yellow. Same thing. Neat folks. I hope to visit again. Galapagos April 20, 2010 (4 of 4): Walk On Punta Espinosa of Fernandina Island. Of all of the excursions we took on this trip, I personally found this one to be the one that captured the essence of the Galapagos more than any other. Life was abundant, the land was harsh, and the contrasts between lifeless and teeming were distinct. This was also the hike that drove home exactly how harsh life on the islands can be for any given individual animal, while the population, as a whole, thrives. More on that in another post as the pictures are rather brutal. Isla Fernandina is the most active volcano in the archipelago (and one of the most active in the world). Thus, it is an island of many fresh lava flows intermingled with the green of new, and sometimes relatively old, growth. As the rich sea upwellings strike the island, it supports a diverse and rich ecosystem at the shore. Much of which we were about to see. Looking across the lava flow and beaches from our Zodiac, it looked like the entire island was covered ancient weathered logs. Not so! 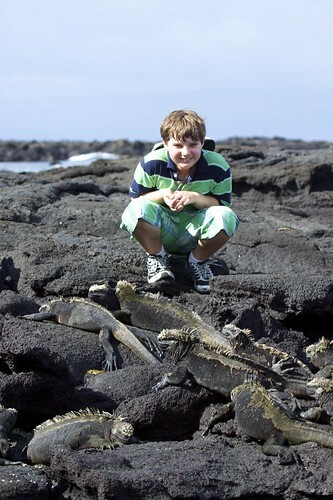 There were hundreds and hundreds of marine iguanas. Thousands, actually. And, oddly, in the late afternoon sun, they largely align themselves in the same direction towards the sun. 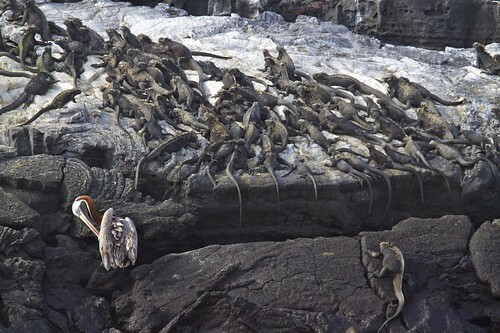 As mentioned in a previous post, marine iguanas are cold blooded. They regulate their temperature by both pressing their bodies against the hot lava rocks and/or controlling the cross section of their bodies exposed to the sun. As can be seen in this photo, the iguanas were entirely un-phased by our presence. Actually, the bigger risk was to us! Namely, after the iguanas spend time feeding in the ocean, they sit on the rocks, warm up, and sneeze out salt water. If you are posing like Roger was in this photo, you run the very real risk of being sneezed upon!! No surprise, Roger spent a bunch of time trying to get sneezed on! Not only did we do a Zodiac tour of the coast line and cave, but we also hopped in the water for some snorkeling in the calm, almost bay-like, shallows near the shore of Punta Vicente. 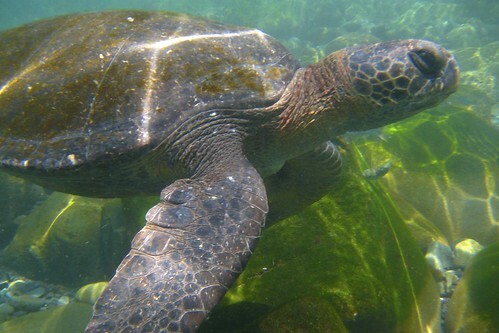 This particular area is well know for the vast number of Galápagos Green Turtle (Chelonia mydas agassisi) that hang out in the water. As there isn’t much in the way of sandy beaches, this spot didn’t really seem to be an attractive nesting grounds. At least not for the turtles. 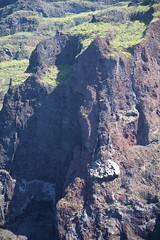 The flightless cormorants, penguins and other birds could be seen nesting all over the cliffs and rocky beaches. 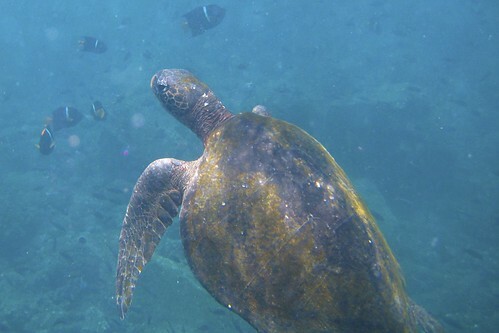 Unlike other areas of the world, the turtles in the Galápagos showed no real fear of humans. They were perfectly content to float about. However, there was one very absolutely strict rule; do not approach or touch the turtles. On the other hand, if a turtle decided to inspect you, that was OK! While Roger and I were diving down to get a closer look at the ocean floor, we turned to our right and this rather grand turtle had swam right up to us for a closer look! This particular turtle followed us around for a bit, getting within a couple of feet even though we were trying to keep our distance. While an incredibly impressive creature, this particular snorkeling spot had much more to offer. Anchoring off Punta Cicente Roca after our long journey around Isabela Island, we were greeted with quite the geological smorgasbord of coastline. Beyond this rather stunning point of green with cave below, you can see a much rawer bit of dark lava to the right. To the north — just beyond that cave — are long stretches of coastline that are largely raw, relatively, fresh lava flows with swaths of green where the lava hadn’t flowed in the last 100,000 or so years. Even in this relatively small bay, there were sandy beaches, weathered cliffs of a sandstone like rock, broken tumbles of lava boulders and dramatic sheer cliffs. With all of the different kinds of coastline in such a small area, this was clearly a spot worthy of further exploration. Before diving into one spot (literally), we took a zodiac based tour of the shore to see what critters might be around. During the night, we crossed the equator while traveling northward on our way to the westernmost islands of the Galapagos archipelago. 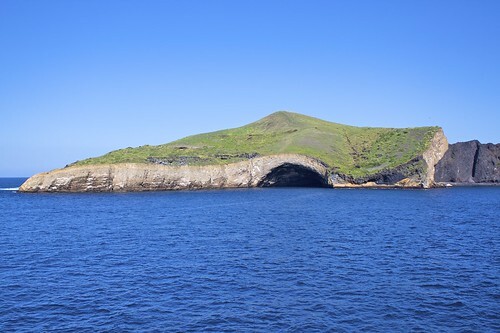 Specifically, our destination was snorkeling off Punta Vicente Rosa (Isabela Island) followed by a hike over lava flows on Punta Espinosa (Fernandina Island). First, though, we had to get there. At about 6:30am, we were woken by an announcement that a couple of large schools off dolphins off both sides of the ship. Literally hundreds of dolphins cruising through the water on the way to wherever dolphins go at the crack of dawn. But not just swimming. 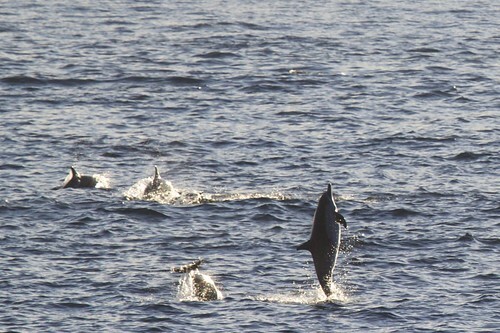 Quite a few of the dolpins seemed to want to fly, leaping high out of the water, twisting about, and splashing along. The captain of the ship circled us about for a while amongst the dolphins and we had nearly an hour amongst these magnificent creatures. 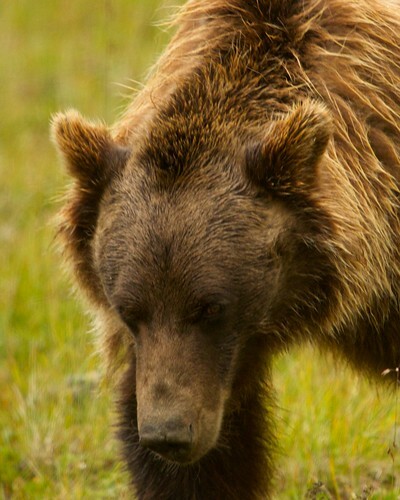 Photography aside: This is when the Canon 100-400mm lens really came through. 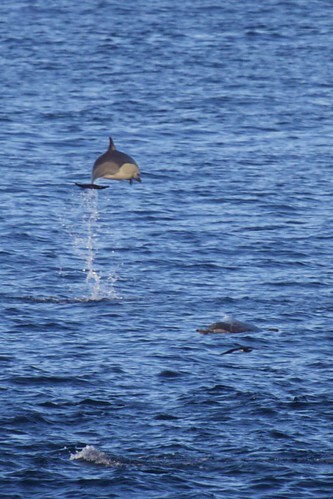 The dolphin were mostly far off from our boat. Having an image stabilized lens with 400mm of reach on a 1.6x crop factor camera body made these images possible. That and a bit of patience, a touch of luck, and a willingness to burn through a few hundred exposures before 7am. After the wonderful snorkeling in the AM off Champion Island, the Endeavor lifted anchor at lunch and took a short cruise to anchor just off of Cormorant Point (Punta Cormorant) for an afternoon of beach walking and hiking on Island Floreana. Floreana is a middle-aged island in the archipelago. Thus, it actually has honest-to-goodness beaches while still having volcanic cones and a handful of fairly raw, mostly lifeless, lava flows. Access to any part of any of the Galapagos islands outside of the handful of human enclaves is extremely restricted in what is, effectively, a gigantic natural park. Floreana offers one of the few beaches upon which we could wander freely. And so we did prior to taking a walk across Cormorant Point to a second beach that was also the nesting grounds of green turtles. Upon landing, Roger immediately found something interesting. 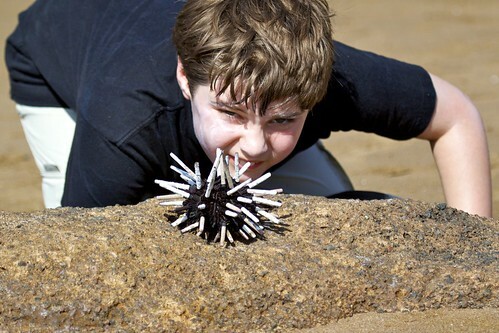 In this case, a sun-bleached pencil urchin. On this particular Lindblad cruise, there were actually quite a number of kids. The free beach time was also an opportunity for the kids to swim about and generally get in some quality beach play. The waters were warm and, on this beach, quite clear. Not surprisingly, the kids weren’t the only ones to show up on such a beautiful beach. The ever present sea lions were out and about, too. 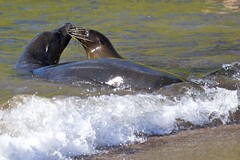 While the kids were in the water, you would often catch a glimpse of a sea lion or two swimming about near or, even, between various swimmers! The beach had its share of creatures beyond sea lions, too. This brown pelican — rather grand brown pelican — was hanging out on one end of the beach. Combining the lack of fear of humans with the low afternoon light, it made for a very patient and stunning photography model! I ended up taking about 100 frames of this one bird, varying parameters, angle and framing. Between the patience of the bird and me being able to take the time to do a proper photographic study of this magnificent creature, I ended up with enough “keepers” to devote a post to this one subject! What an absolutely incredible creature! 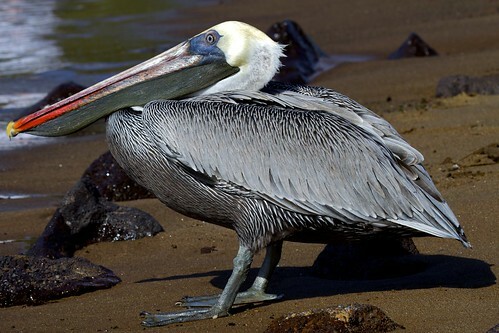 While beachwalking on Island Floreana, we came across a brown pelican hanging out on one end of the beach. It was late afternoon and the sun was fairly low in the sky, making for some wonderful warm lighting as long as I could maneuver around to the right angle. Which, of course, proved to be easy given that the pelican really couldn’t care less what about me. 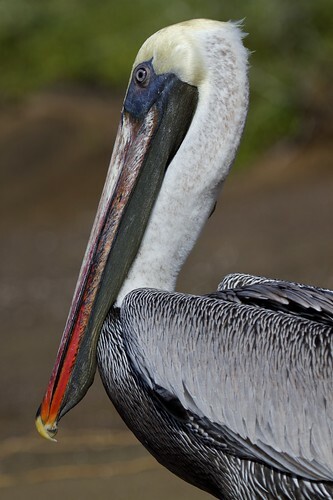 Pelicans are quite interesting geometrically. They can choose to maintain a relatively horizontal profile or can lift their head up, tuck in their bill, and go for a vertical appearance as in this shot. With just a bit of a wind, the feathers on the back of the bird’s head were fluttering slightly in the wind. The color near the end of that viciously hooked bill is exquisite, too. Like I said, wait for a moment and you can grab a vertical profile or a nice horizontal shot like this one. Given the texture of the feathers, I’d bet this pelican had been fishing not long before and was so patient because the sun was warm. Take enough photos and you’ll eventually get something truly out of the ordinary. 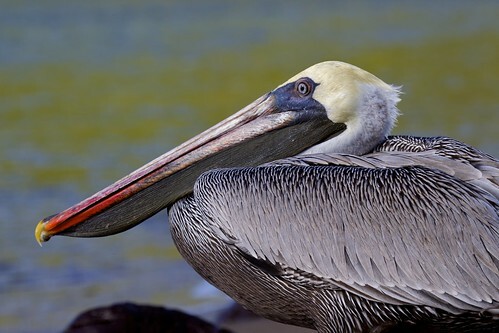 In this case, I caught the pelican mid blink. 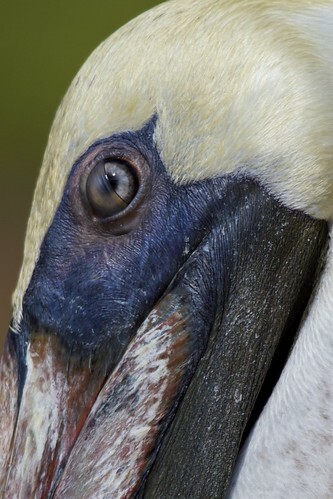 That would be the pelican’s nictitating membrane, if I’m not mistaken. I would like to say that it was my awesome skills applied to an epic shutter finger that yielded this photo. This is the product of taking about 100+ photos of this one bird. Choose an angle, choose a framing, choose some settings (I shot all of these in manual mode to get a feel for it), and fire off three to five frames (my camera is pretty much always in multi-frame mode). The beauty of digital is that there is no more cost incurred, save for a bit of your time selecting the best shots, for shooting one frame versus 10 of any given subject! The seas around the Galapagos are every bit as biologically interesting and diverse as the land, but in a different way. Whereas there are relatively few land dwelling species on the island, all unique and generally completely lacking in fear of humans, the sea life is more in line with what you would expect in relatively tropical waters around the world. 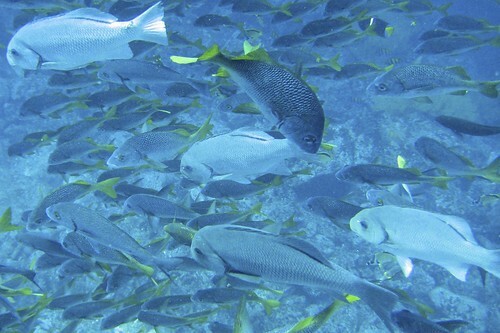 While the fish were fairly typical, the underwater environment was otherwise atypical. Notably, there simply isn’t any significant coral growth. No coral heads of any size. No coral reefs and none of the rough, nook and cranny filled, walls of coral growth normally associated with tons of tropical fish. Instead, and making the waters of the Galapagos fairly unique in and of themselves, the lava foundation of the islands provides all the hidy holes marine life of all sizes might need. To provide the biomass to feed the incredible numbers of fish and other marine life, the islands sit at the cross roads of five ocean currents, with major currents dominating from the South, North, or West depending on season and El Nino. 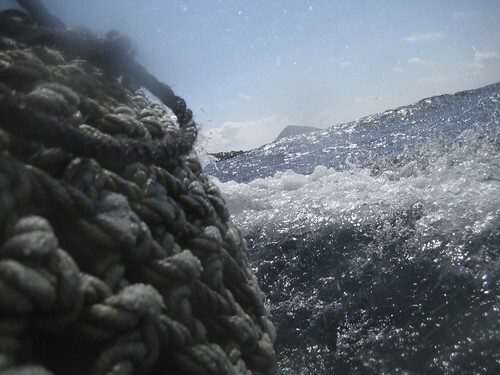 Some of the currents are quite deep and bring up tons and tons of biomass in the form of plankton and other deep sea creatures as the currents hit the archipelago. As a result, there is plenty of biomass to support a dense and diverse marine population. Yet, those very currents — the one up the west coast of South America from the Antarctic — also means that the water temperatures can be really cold for part of the year. Hence, no significant coral growth. Coral needs a constant, relatively warm, water temperature. Travel tip: If you are planning on visiting the Galapagos, go in April/May. The predominant water current is very warm and, thus, we spent the week snorkeling in 79 to 82 degree water. No wetsuit needed. If you were to visit the same locations in August-ish time frame, the water would be a chilly 65 degrees! In any case, enough words. What about the creatures themselves?